Smaller fun for your littler one! 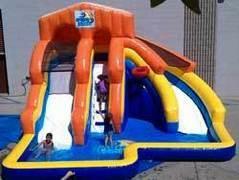 While they may be more appropiately sized for your littlest one, there is no shortage on fun in these inflatables! As your toddlers crawl inside, they encounter fun colors, pictures, activities, and obstacles. Click on a picture below to find more pictures and information. Delivery rates may apply. Check our Service Areas page for a list of cities and delivery fees.